This post written by Jane Stojanovic (RM, RGON, MA [Applied], ADN) was first published in Birthspirit Midwifery Journal 2010; 2: 53-60. Childbirth for European women in early twentieth century New Zealand was family centred. The majority of births took place in the home, accepted as a difficult but natural part of a woman’s role in life. Midwives were mostly married women who worked autonomously and had usually borne children themselves. By the 1970s this picture had dramatically changed. Virtually all births took place in hospital and were under the control of medical men and women. When legislation was passed (the Nurses Act 1971) that removed the right of New Zealand midwives to practice autonomously, New Zealand midwifery had largely been subsumed by nursing, controlled by medicine and displaced from a community based profession into a hospital based workforce. This article examines how the trends of medicalisation, hospitalisation, and nursification changed the New Zealand maternity services from 1900 to 1971, outlining the effect those changes had on the midwifery profession. The changes described here were also common to other western societies; examining how they occurred provides a context for understanding the history of midwifery in New Zealand. The Nurses Registration Act had been passed in 1901, drafted and implemented by Neill, but there was much less support for the Midwives Bill. Enforced registration was a threat to the majority of midwives who were untrained therefore passing the Midwives Act was a more difficult proposition. Some doctors had part or full ownership of maternity homes and did not welcome the idea of the state intruding on their preserves. John Neill, Grace Neill’s son, wrote in her biography that the doctors were not as concerned about the “initial loss of patients as the threat of future state control”.10 However, despite their protests, St Helens Hospitals and their associated training schools for midwives did come into being when, with the support of the Premier and some astute political manoeuvring, the Midwives Act 1904 became law. The first St Helens Hospital to open was in Rintoul Street, Wellington, in May 1905, followed by Dunedin and Auckland. Slowly until 1920, others were opened in Christchurch, Gisborne, Wanganui and Invercargill. 12 They were administered by the Department of Health until 1966 when they passed to the control of the Hospital Boards. Each St Helens hospital had a medical superintendent but was otherwise managed and staffed by midwives, who called on the Medical Superintendent’s help only when needed.13 Despite some successful efforts by the medical profession to take over these hospitals for the training of medical students, the midwifery schools continued until 1979 when responsibility for midwifery education passed into the tertiary education sector. Seven years later, in 1927 fifty-eight percent of New Zealand births took place in maternity hospitals. By 1936 this had risen to almost eighty-two percent.17 Joan Donley, a homebirth midwife and midwifery activist in the 1980s and ‘90s, believed that women accepted hospital birth because of “… their economic situation or living conditions, for a rest from house-hold chores and the care of large families, or because (increasingly) they were lured by the promise of ‘painless child-birth’ ”.18 The development of hospitalisation for childbirth was led by the medical profession and was closely linked to developments in anaesthesia and asepsis. ‘Twilight sleep’ did not take away all of the pain of childbirth but it did remove the woman’s memory of the pain, so the consumer’s perception was of a painless labour and birth. 21 To achieve the desired effect doctors used a cocktail of drugs, particularly the barbiturate known as Nembutal and Scopolamine (Hyoscine).These were often augmented by the use of Chloroform in second stage. This was a very labour intensive regime which required increased observation and monitoring of the semi conscious woman, necessitating interventionist techniques such as regular vaginal examinations because of the birth attendant’s inability to ‘read’ the progress of the labour by observing the behaviour of the woman.22 Normal childbirth behaviours were no longer present in the sedated woman. In the process of achieving ‘painless childbirth’, therefore, the woman gave up control of her birth process to the birth attendants and became an invalid to be tended, observed and monitored. 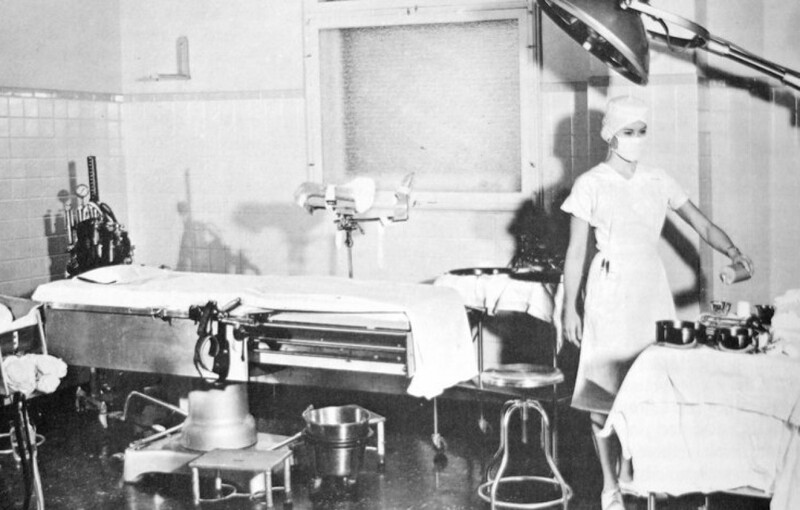 By the 1950s birth took place in a room very similar to an operating theatre, under very similar conditions to a surgical operation. These procedures persisted; in the 1970s, as a student midwife I remember spending a lot of time acquiring the skills of sterile technique, learning how to cover the woman correctly with sterile drapes which, of course, required the woman to remain in a horizontal position and that necessitated the use of the lithotomy position and ‘stirrups’ to hold her legs in place. The aseptic techniques introduced in the1920s are credited with hugely lowering the maternal mortality from puerperal sepsis well before the introduction of antibiotics. 29 It was considered necessary to teach doctors, midwives and nurses the importance of stringent asepsis, and perhaps the severity of such measures helped to disseminate the message, but it could be speculated that other ways of lowering the risk of sepsis such as keeping mothers at home rather than together in hospital, the separation of maternity wards from general wards, careful hand-washing and later, glove wearing would have done much to improve the situation without the need for such depersonalising procedures to persist for so many years. Midwives and hospitals were also catered for in the government payments for maternity services. Midwives could claim payment from the Health Department for home birth care and were still legally able to provide care without a doctor’s involvement but most women chose medical care and the midwives were, therefore, forced to work with doctors in hospitals. The Midwives Act 1904 began the process of putting midwifery under the control of medicine and began the introduction of the nursing culture into midwifery by creating the nurse-midwife. A lay person could study for twelve months to become a midwife; a nurse registered under the Nurses Registration Act 1901 could train in six months. Having a double qualification was useful and increased the likelihood of gaining higher status in the profession.45 I would argue that this was the beginning of the nursification of midwifery and that maternity’s move to the medicalisation and hospitalisation of birth increased the momentum of the nursification of midwifery. Papps and Olssen point out that although Nursing and Midwifery as professions were closely aligned in New Zealand from the early twentieth century, they were two distinct professions with their own regulatory registration Acts. From 1925 that changed when both disciplines were regulated by the same Nurses and Midwives Registration Act. This Act enabled women to register as maternity nurses and changed midwifery training into a postgraduate course.46,47 Some traditional midwives became classified as maternity nurses, able to care for women only under the direction of a doctor or midwife. The grave shortage of nurses and midwives that followed the Second World War was intensified in maternity hospitals due to the post-war ‘babyboom’. Consequently there was a Committee of Enquiry into Maternity Hospital Staffing in1946 which looked beyond staffing and examined the maternity service. From this a commit-tee was formed which excluded midwifery representation but included medical and nursing representation. Generally doctors were seen as important, knowledgeable and benevolent. Men and women listened to them and accepted their advice, and doctors were teaching the student nurses and student midwives. Midwifery leaders were also qualified nurses as generally ‘Ward Sister’ status would not be awarded to a midwife unless she was also a registered nurse. Midwifery educators were also nurse-midwives and usually had the status of ‘Sister’. 1,45 This meant that the clinical and theoretical components of midwifery were taught by doctors and nurse-midwives who, of course, imbued their teaching with the cultures and expectations of their particular disciplines. When in 1971, the law removed midwives’ ability to attend women without the participation of a doctor it merely legitimised what was, by then, the established pattern of hospitalised maternity care. This is demonstrated by the total omission of comment in New Zealand Nurses Association Journals (Kai Tiaki) of 1971/72 on the effect that the passing of the Nurses Act 1971 would have on midwives, also indicative of the powerlessness and invisibility of the minority midwife membership within that organization. Medicalisation, hospitalisation, and nursification were the most important influences to shape both the maternity service and midwifery. The professionalisation and nursification of the midwifery service started with the passing of the Midwives Act 1904 and the formation of the St Helens Hospitals and Training Schools for Midwives. This placed midwives under medical control and encouraged the nursification of midwifery. Despite homebirth and midwifery being supported by the Health Department, technological progress, especially the developments in asepsis and anaesthesia, aided the medical profession in making hospital and medically controlled birth attractive to women. The Obstetrical Society was formed to resist control from the Health Department, and once formed became a strong lobby group, achieving both of its aims – the setting up of a Chair of Obstetrics at Otago University and the reforming of the maternity service. The Social Security Act 1938 that benevolently granted free medical, midwifery and hospital care to women accelerated the hospitalisation of birth and aided in the almost total transformation of midwives into ‘obstetric nurses’ who were skilled in their own areas of hospital nursing, but who had lost the knowledge and confidence to care for birthing women outside the hospital system. As in other Western countries, by the 1970s the medicalisation and hospitalisation of birth changed most midwives’ perception of birth; they accepted iatrogenic outcomes (such as breast engorgement in the lactating mother) as the norm and lost the experiential knowledge of birth that had been handed down for centuries from woman to woman.60 This situation continued until pressure from women’s groups and midwives, and a providential political climate facilitated the passing of the Nurses Amendment Act 1990 returning autonomy to New Zealand midwives and allowing them to practice in the community again, providing individualised continuity of care for women. Stojanovic J. Leaving your dignity at the door: maternity in Wellington, 1950–1970. [MA (Applied) Thesis]. Wellington (NZ): Victoria University of Wellington; 2003.
Cooper M. The Midwives Case, 1920 to1930. In: Chick N, Rodgers J, eds. Looking back, moving forward: essays in the history of New Zealand nursing and midwifery. Palmerston North (NZ): Massey University, 1997. Autonomy was returned to New Zealand midwives with the passing of the Nurses Amendment Act 1990. Manson C, Manson C. Dr. Agnes Bennett. Michael Joseph: London, 1960; pp. 48-49. Donley J. Save the midwife, New Women’s Press: Auckland, 1986. De Vore C. Midwives as business women. In: Chick N, Rodgers J, eds. Looking back, moving forward: essays in the history of New Zealand nursing and midwifery. Palmerston North (NZ): Massey University, 1997; pp. 44-57. Neill J. Grace Neill, the story of a noble woman. Peryer: Christchurch, p.27. De Vore, Op. cit; p. 48. McLean H. Nursing in New Zealand, history and reminiscences. Tolan Printing: Wellington, 1932; p. 59. Bowerbank F. Doctor’s story. Wingfield Press: Wellington, 1958; p. 81. Mein Smith P. Maternity in dispute, New Zealand 1920–1939. Historical Publications Branch, Department of Internal Affairs: Wellington, 1986; p. 1. St Helens Outdoor Casebook 1913–1918. Donley J. Op cit; p. 39. Donley J. Op cit; p. 40. Mein Smith. Op cit; p. 81. Papps E, Olssen M. Doctoring childbirth and regulating midwifery in New Zealand. Dunmore Press: Palmerston North(NZ), 1997; p. 111. Also known as childbirth fever or puerperal sepsis. Mein Smith. Op cit; p. 23. Special Committee on Maternal Mortality in NZ(1921) AJHR1(H-31B):4. Mein Smith. Op cit; p. 21. Parkes C (1991) The impact of the medicalisation of New Zealand’s maternity services on women’s experience of childbirth 1904–1937. In: Bryder L, ed. A healthy country: essays on the social history of medicine in New Zealand. Bridget Williams Books: Wellington. Donley J. Op cit; p. 42. Mein Smith. Op cit; p. 64. Donley J. Op cit; p. 45. Gordon D. Backblocks baby doctor. Faber & Faber: London, 1955. De Vore, Op. cit; p. 46. De Vore, Op. cit; p. 55. Gordon D. Doctor down under. Faber & Faber: London, 1957; p. 53. Gordon, 1955. Op cit; p. 207. Mein Smith. Op cit; p. 43. Mein Smith. Op cit; p. 41. Papps, Olssen. Op cit; p. 120. Mein Smith. Op cit; p. 119. Stojanovic J. Op cit; p. 48. Jackson JF. Oral history tape, Personal records, Stojanovic Family Archive, 2009. Annual Report of the Director of Health(1945),AJHR1(H-31):7, p. 7. Gordon, 1955. Op cit; p. 103. Gordon, 1955. Op cit; p. 105. Wassner A. A labour of love, childbirth at Dunedin Hospital 1862–1972. Wycliffe Press, Dunedin (NZ), 1999. Tully L, Daellenbach R, Guilliland K. Feminism, partnership and midwifery. In: Du Plessis R, Alice L, eds. Feminist thought in Aotearoa/New Zealand, differences and connections. Oxford University Press: Auckland, 1998; p. 44. Papps E, Kilpatrick J. Nursing education in New Zealand – past, present and future. In: Papps E, ed. Nursing in New Zealand, critical issues and perspectives. Pearson Education New Zealand, 2002; p. 4. Papps, Olssen. Op cit; p. 125. Pairman S. Towards self-determination: the separation of the midwifery and nursing professions in New Zealand. In: Papps E, ed. Nursing in New Zealand, critical issues and perspectives. Pearson Education New Zealand, 2002; p. 16. Papps, Olssen. Op cit; pp. 125-126. Donley. Op cit; p. 99. Dobbie M. The trouble with women: the story of Parents Centre New Zealand. Cape Catley: Christchurch. 1990; p. 17. Pairman S. From autonomy and back again: educating midwives across a century. Part 1. New Zealand College of Midwives Journal 2005;33:6-10. Davis D. Spoilt for choice: consuming midwifery care. British Journal of Midwifery 2003;11(9):574-578. Kinross N. Politics and power. In: Smith M, Shadbolt Y, eds. Objects and outcomes, New Zealand Nurses Association 1909–1983 commemorative essays. New Zealand Nurses Association, Wellington, 1984. Miller N. Post-basic nursing education, in Smith M, Shadbolt Y, eds. Objects and out-comes, New Zealand Nurses Association 1909–1983 commemorative essays. New Zealand Nurses Association: Wellington, 1984. Stojanovic. Op cit; p. 53. Katz Rothman B. Giving birth, alternatives in childbirth. Penguin: New York, 1982; p. 23. Douche J. Personal communication, 2007. Odent M. Primal health. Century: London, 1986. Reprinted with kind permission. 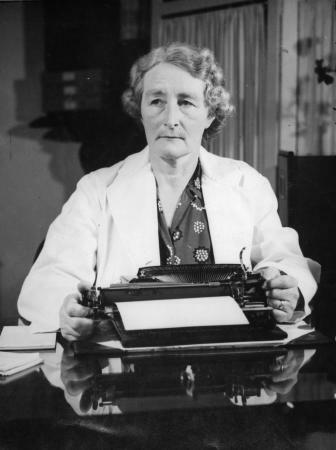 Stojanovic J. Midwifery in New Zealand, 1904 – 1971. Contemporary Nurse 2008; 30:156-167. ©eContent Management Pty Ltd.